Rapi Twitter Embed allows you to embed tweets on your website from Twitter. To get the twitter post on your website, all you need to do is copy the twitter post URL. 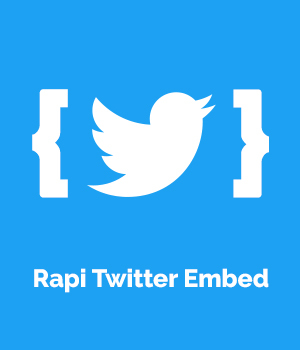 If you are looking for a solution that can allow you to give a reference of a twitter post on your website, the Rapi Twitter Embed plugin is just for you. easily click on the Twitter Embed button and enter the tweet id. Ability to use anywhere on the site. Possibility to set tweet width. Ability to set the direction of displaying tweets (left, right, and center). No limits on the number of tweets.